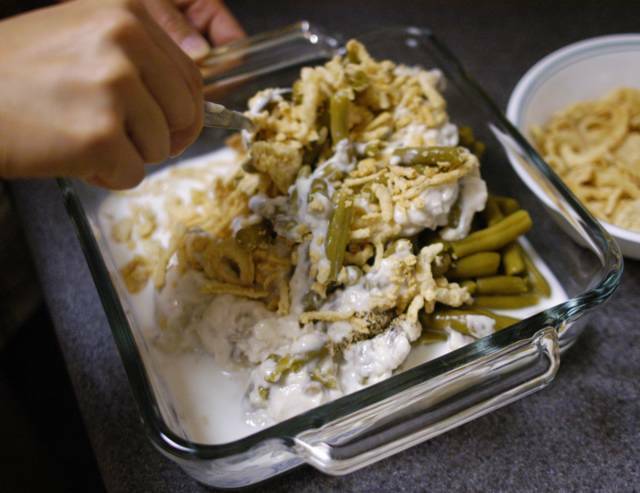 Green bean casserole is a classic homestyle favorite in American homes. 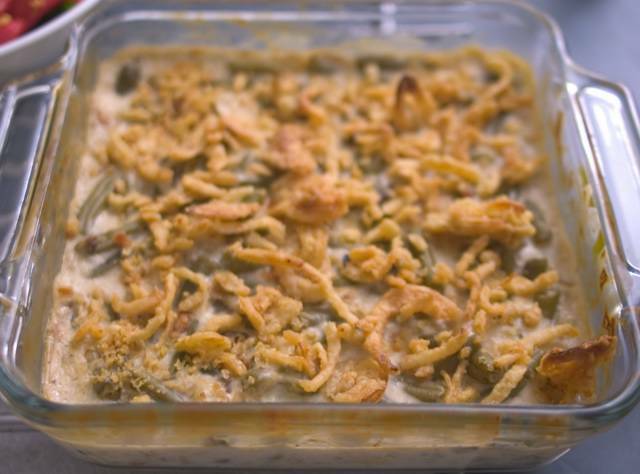 This particular recipe from Campbell's is probably the most popular recipe for green bean casserole. Not only is it easy to make, but it's delicious. 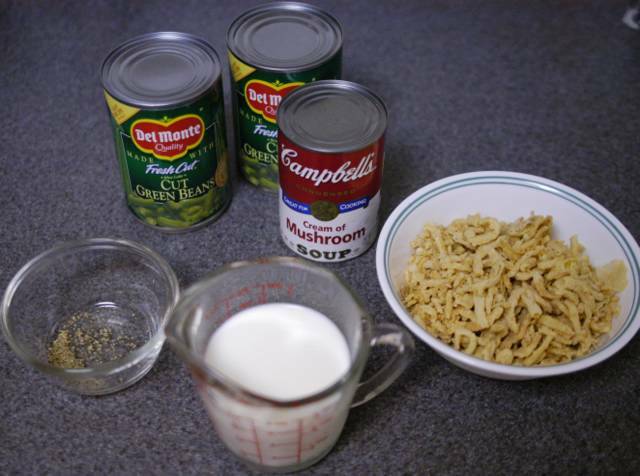 The "correct" way to make Campbell's Green Bean Casserole is, of course, to use Campbell's brand Condensed Cream of Mushroom soup and French's brand Original French Fried Onions. Of course, any other brand of cream of mushroom and french fried onions will do. Assemble the ingredients: 3/4 cup whole milk, 1/8 tsp. pepper, 10-3/4 oz. can cream of mushroom, two 14.5 oz. 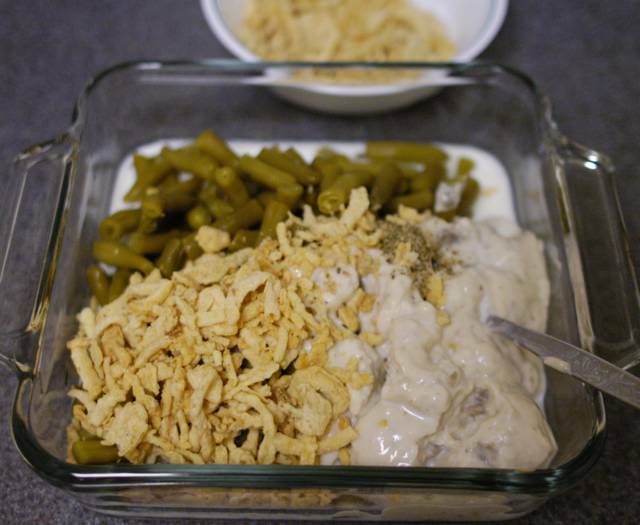 cans of cut green beans, and 1-1/3 cups french fried onions. Bake at 350°F (175°C) for 30 minutes. After thirty minutes in the oven, the casserole should be nice and hot. Take it out and top with the reserved onions. Bake for an additional five minutes. 2 14.5 oz. cans of cut green beans drain mix bake 350°F 30 min. bake 350°F 5 min. Definitely a classic! Brings back memories... my family always served this at Thanksgiving. Eeek, yeah. Brings back memories. I attempted to cook my way through a 1965 Campbell's cook book. I couldn't do it. Just too darned icky and when I found myself searching for Cream of Shrimp I called it quits. Cream of Shrimp? Do they really make that? thank you for the dinner ideas. i will now have something better than Wendy's to eat while i blog and study. I must take exception to your statement that any other brand of cream of mushroom soup would do. I want to warn against the store brands! I am frugal (okay, okay--cheap!) and have tried the store brands and they are SO not worth the few pennies saved. In fact, they taste so bad, they'll ruin what you put them in! Now, maybe brands that are MORE expensive than Campbell's would work (haven't tried any of those! ), but do yourself a favor and do not use store brands. Using frozen green beans is tastier than canned. 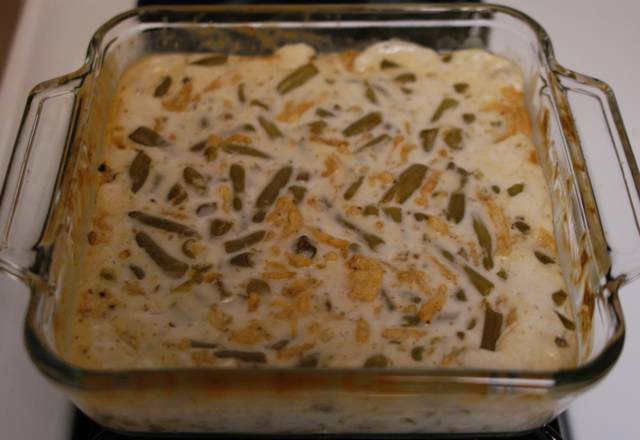 I agree, using frozen green beans is a tastier option for this casserole. if i was to double up on all the ingredients to make it for 12 pepole how long do i need to cook it? double the time? I would bake it only a few minutes longer (this actually depends on the shape of your pan). Instead of baking for 30 min., bake for 40 min. It's ready when the edges just begin to bubble. At that point, just add the final topping of french fried onions and bake for 5 min.